Likewise the Kiama Big Fish comp was held over the weekend. Some spectacular fishing among the fleet (full results below). Port Hacking GFC’s Dog House took the clean sweep in Capture with all three of the heaviest blues at 224kg (Mick Bailey), 193kg (Matt Day) and 160.5kg (Tristan Davis). Outside of the comps and in the leadup to the Mooloolaba GFC’s Garmin Billfish Bonanza coming up this weekend, some more great fishing. Brent Higgin’s Sicario (SCGFC) had an awesome day heavy tackle with 7-6-3 blue marlin! Meanwhile the light tackle inside continues to fire. The Mooloolaba GFC team on Ymer tagged 6 (5 blacks and a sail). As skipper Ben Stasiak says that it has been a late start (as far as numbers go) to the Sunshine Coast light tackle season this year, but good schools of slimies have recently been holding over the grounds of late. And plenty of boats have been enjoying days tagging multiple fish (more results below!). On Ymer after a late start they hooked a black straight away on the bait jig! Among the fish they had a triple hook up of real small blacks which created a bit of excitement and even better they managed to tag all 3. Finished the day with another black and a large sailfish. Ben said it was also interesting to note the different size in the blacks with some real young fish hanging with 2-3 year old fish. 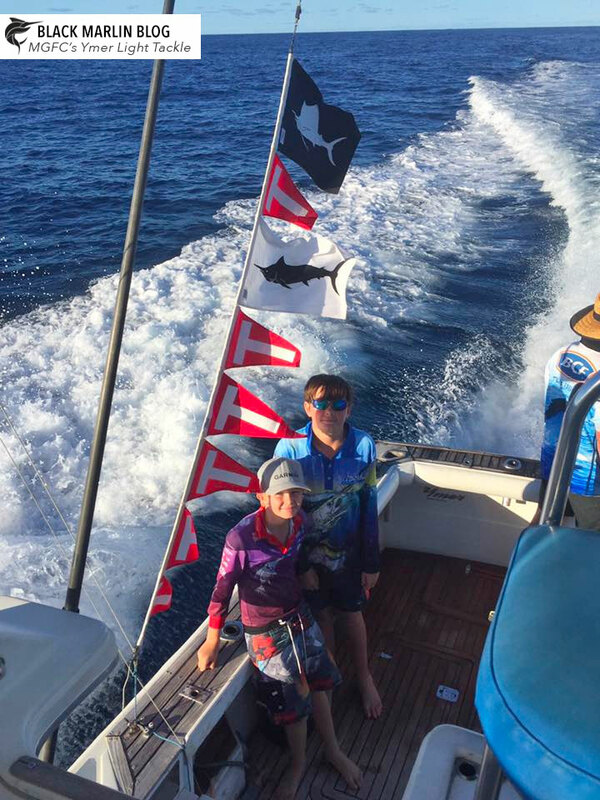 Channan Arbuthnot went 5 from 8 solo in his boat Reel Game (7 blacks and one sail). Channon said he lost 3 due to double hook ups – a tough gig when you’re the only one on board! SCGFC’s Club Captain Rob “Smithy” Smith also tagged two on his charter yesterday and jumped another marlin off mackerel fishing later in the day! For sale with Game & Leisure boats are two iconic names of the Australian game fishing industry Huntress and Maitai. Check out more interior and running shots here.